Welcome to the big 100th Penny Pinching Party! Sadly I am not doing much these days other than looking at flooring, reading about flooring, and looking at some more flooring. I will feel like celebrating when I finally have a floor in, so for now you will have to endure endless posts about flooring. When we took out our tile, we had to put a new subfloor in. 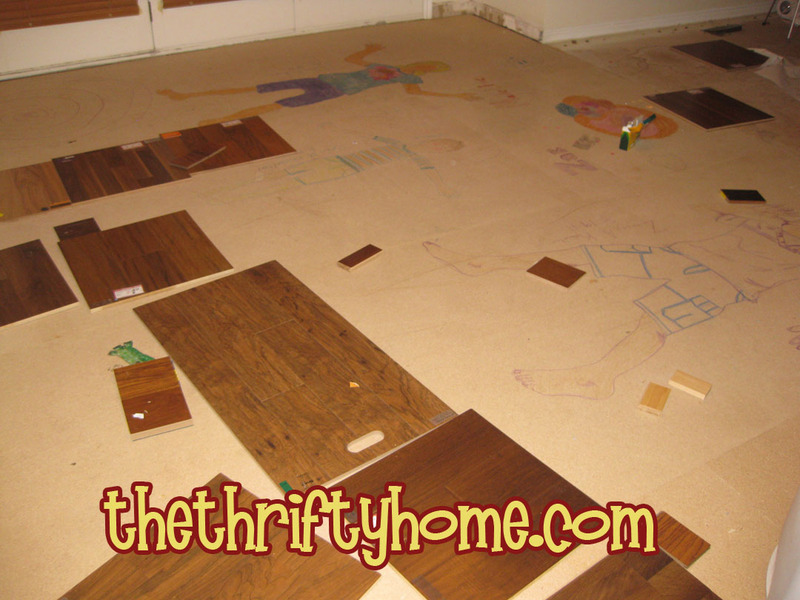 Since we will just be covering up the subfloor, I figured I would let the kids have some fun coloring on the floor. How often do kids get to color all over the floor without getting in trouble? We did this at our last house when we re-did the floor there about 8 years ago so my older kids don't remember much and my youngest wasn't born yet. It is kind of like having a time capsule under our feet for years to come. Too easily scratched, costly and messy to refinish when needed, expands and contracts more, very thick. The thickness is really the main reason I am ruling real solid wood out. I need to have the wood floor meet with the tile in the entry and I don't want to trip every-time I walk into the kitchen. I had ruled this out until I saw some BEAUTIFUL engineered wood floors at Lowes. I thought they would scratch easily but the sample I ran my key on hardly scratched. It seems to be just as tough as the laminate flooring. I have been doing some research and have discovered that Shaw has developed a new technology called ScufResist Platinum. It is said to be up to 6X better than the competition and will help the flooring retain its beauty longer. 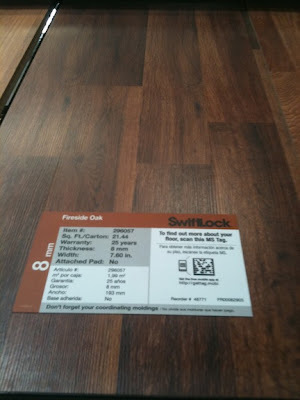 It seemed to make the flooring as durable as laminate. Another great thing about engineered wood is that every plank would be different as opposed to only about 5 different planks in laminate. Here are a couple of pictures I took with my phone. Even with the bad quality photo, these floors look so beautiful. The problem is that they are a little over my price range (I was going to spend up to $3 a square ft. at the most). I had Pergo laminate at my last house and it lasted 7+ years and still looked great. Laminate is really durable and doesn't scratch easily. The engineered wood is hand scraped and has grooves which is beautiful, but not ideal for my kids. They like to spread out big sheets of paper and color on the floor. Having a nice smooth laminate would make a great place for them to stretch out and do their artwork. It is also in my price range from as low as $1-$3 per sq. ft. We are doing 1000 square feet of flooring so every dollar we add equals another $1,000. 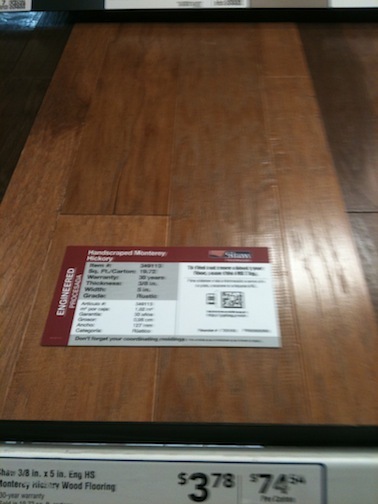 Here is a photo I took at Lowes of their $1.19 laminate. So what would you do? 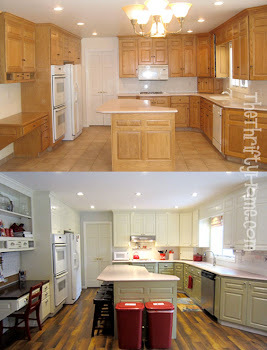 I really need to decide soon and get my life/kitchen back together. I love the look & feel of a handscraped floor, but for durability and budget, you can't beat laminate. We put some in our family room & rec room in the basement, and it's held up beautifully to our active boys. Can't wait to see what you end up choosing. 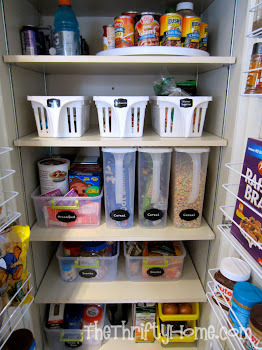 Thanks for hosting this linkup party. Good luck on choosing a kitchen floor, and thanks for hosting! I have laminate all through my house and we did the fireside oak. The only thing that drives me bonkers dark wood shows every speck of dirt and dust. Thanks for hostessing another great party! 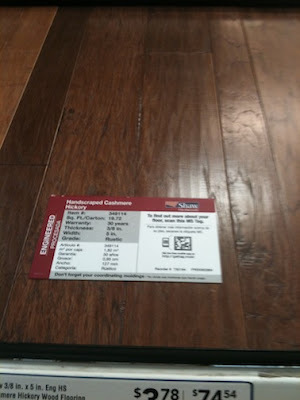 i'm not trying to put real hardwood back in the running, but 2 points: a) Varathane brand polyurethane makes a new-ish product (at least to us canucks) called 'Nano Defence', & while other polyurethanes have some 'nano' in it i think there's a higher concentration in this stuff (better be for the cost!!) with a 5 yr no scratch guarantee. it scuffs but i haven't seen scratches yet on my floors (yes, i use felt pads under most things). (b) you can buy pieces of trim (i call them nosings but no one else seems to) that can transition floors of 2 different heights. Congrats on the 100th party! Thank you for hosting. Hate to go against the GRAIN (har har) but I would prefer engineered flooring. 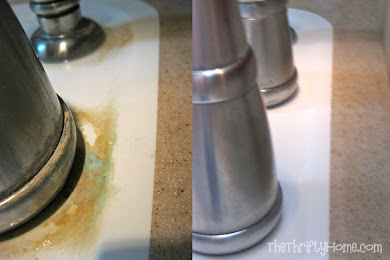 Laminate is non-repairable and doesn't have the same appeal if you resell your home. Engineered wood also expands and contracts like hardwood and looks, in my opinion, a lot better than laminate. I am also going to have to vote against laminate for many of the reasons listed above. But mainly, I prefer the look/feel of the other two options. Thanks for sharing!. I have seen some Reclaimed Parquet Flooring at RFC. Thanks for sharing. Keep exploring.